Sir Joshua Reynolds RA FRS FRSA (16 July 1723 – 23 February 1792) was an English painter of portraits. He helped to start the Royal Academy of Arts and was its first president. 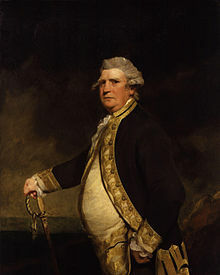 King George III made him Sir Joshua Reynolds in 1769. Some critics disliked Reynolds and the Royal Academy. The Pre-Raphaelites called him "Sir Sloshua" and William Blake published a savage pamphlet Annotations to Sir Joshua Reynolds' Discourses in 1808. On the other hand, Turner was a strong supporter, and asked to be buried at Reynolds' side. Reynolds has over 1000 portraits in the National Portrait Gallery, London. Despite Blake's criticisms, Reynold's Discourses had a lasting impact on the theory and practice of art. This page was last changed on 11 March 2013, at 02:27.